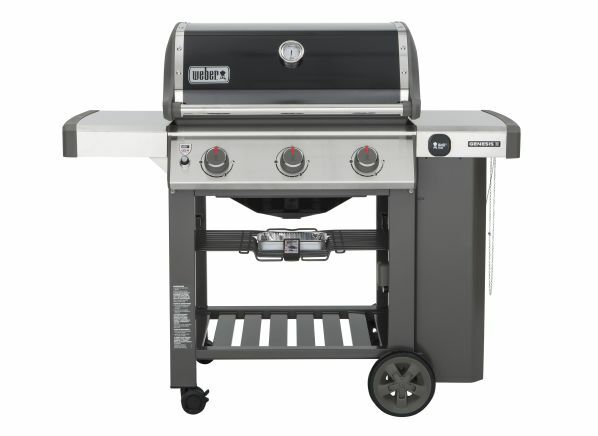 Are you looking to buy a Weber 3-burner gas grill? If yes, then I'm pretty sure you're confused among ‘Weber Spirit II E-310’ and ‘Weber Genesis II E-310’. No doubt, the confusion for opting one product out of these two is quite obvious. As both of the models are from the same brand and both are 3-burner gas grills, so choosing one between Weber Spirit vs Genesis is not an easy task. Weber is one of the best brands when it comes over the market of grills. Not only the product they manufacture but the quality and performance it features is truly commendable. Weber has established their name so strongly in the market, that anyone who wants to purchase a gas grill looks forward to Weber. In this article, we'll be looking at its two series called ‘Spirit’ and ‘Genesis’. 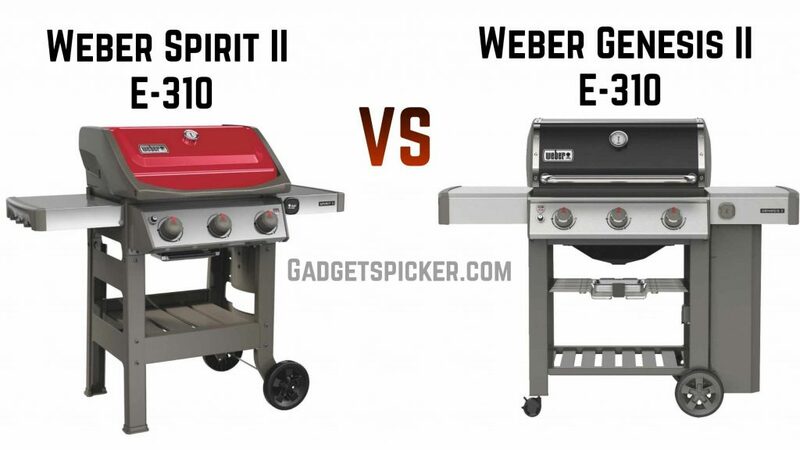 We'll compare Weber Spirit vs Genesis, which will help you in picking a perfect grill fulfilling all your needs. This Weber Spirit II E-310 is one of the latest models of Weber grills which is a perfect combination of style, size, performance, and quality. So if you're looking for a budget-friendly grill, then this can turn to be a good choice for you. With the Spirit series, Weber redecorate their grills with open cart design and by providing multiple color options. This time, the LP tank has been moved outside the grill to free up more space. The best example of such grills is the Weber Spirit II E-310, which we'll be talking about here. This Weber Spirit II E-310 also features GS4 Grilling System that offers Infinity Ignition, flavorizer bars, powerful burners, and grease management system. This model has porcelain-enameled, cast iron cooking grates which are ideal for 5-7 servings. It comes with three stainless steel primary burners that are capable of providing 30,000 BTU of heat output. Weber Spirit II E-310 has a total 529 square inches of total cooking area, with 424 square inches of primary cooking space and 105 square inches of warming rack space. Looking into specifications, this unit weighs 110 pounds and comes with the dimensions of 44.5 x 52 x 27 inches. Weber Genesis II E-310 is a newer upgraded version of the previous Genesis model that offers easy cleanup, reliable temperature, and great cooking performance overall. Weber is a top leading brand that has been manufacturing long-lasting and reliable grills, and this model is a great example of it. This is a 3-burner gas grill that is built with GS4 grilling system, that features updated and tapered burners. Along with this, it also comes with a new ignition system that ensures light up at every attempt. Weber Genesis II E-310 includes three stainless steel primary burners which provide a total heat output of 39,000 BTU. The burners provide even and efficient heat all around the surface. The only thing you'll be missing here is a rear burner or side burner for rotisserie and side cooking. The company provides a total of 10 years warranty on these burners. This model comes with 669 square inches of total cooking space area, where 513 square inches is primary cooking space, and 156 square inches as a warming rack area. 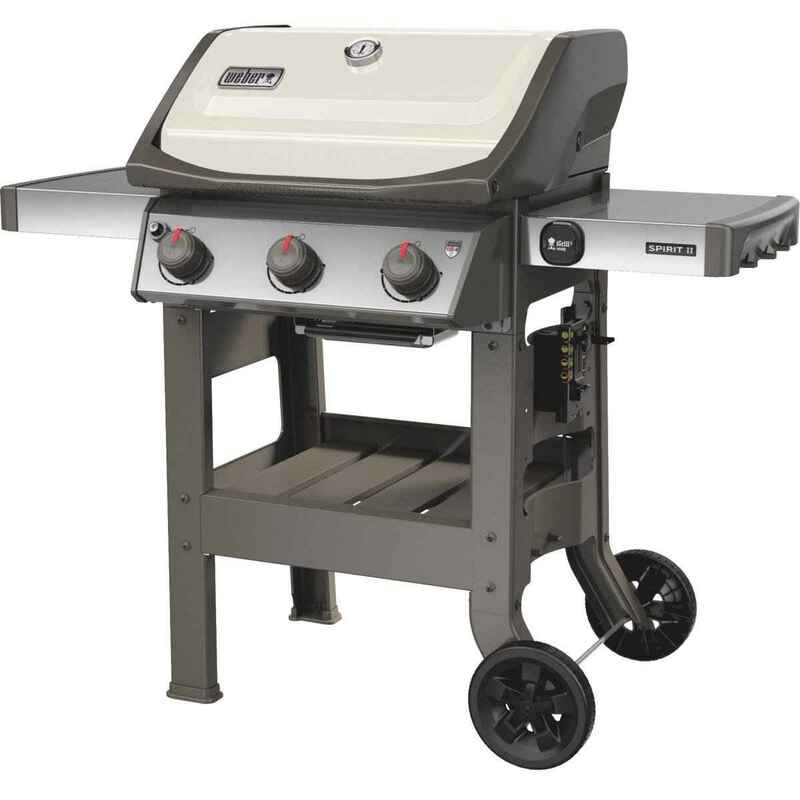 Looking at other specs, this grill weighs 133 pounds and comes with the dimensions of 47 x 59 x 29 inches. One of the basic difference between Weber Spirit vs Genesis is the cooking area. Even though both the models are 3-burner gas grills, but there's a big difference in their sizes. As per specifications, we've found that Weber Genesis II E-310 is heavier and bulkier when compared with Weber Spirit II E-310. This is because Genesis II E-310 has a larger cooking area of 637 sq. Inches. This space is capable of cooking for about 25-27 hamburgers. While on the other side, Spirit II E-310 has a total of 529 sq. Inches cooking area, capable of cooking about 21 hamburgers. It is an obvious fact that a model with the bigger cooking area should come with larger cooking power. This is the heat output which decides whether your grill is capable of doing perfect cooking or not. And if we compare the cooking power, Genesis II E-310 has a total heat output of 39,000 BTU per hour whereas Spirit II E-310 has 30,000 BTU of cooking power. Overall, both the models are very efficient and perform effectively. The older models of Spirit and Genesis used to come with the different ignition system. But thanks to the new Weber GS4 technology, both the grills come with infinity ignition. This means the burners will light up in the very first attempt every single time you use the grill. In most of the other features, both the models are almost identical. Both come with two stainless-steel side tables, which is useful when you perform cooking. Besides this, they also feature six tool hooks, two all-weather wheels for better portability and a fuel gauge which keeps telling you about the amount of fuel remaining in the LP tank. Additionally, both the models are iGrill 3 compatible. Not only this, both are durable, easy to clean and come with a 10-year warranty.